Behold the Radical Sandwich! The Radical Sandwich is laser cut from 1/4 cast acrylic with an elegant angle design. The elegant design incorporates a large handle design to allow for easy lifting of your Radical Sandwich. The design extends the acrylic past the exterior walls of your radiator to not only hold in a beautiful manner, but to also help protect against radiator damage in the event of a fall. The beef of this sandwich happens to be the beefiest of all water cooling radiators - the infamous Thermochill PA 120.3. The dual acrylic plate design allows for any number of condiments to be added to your Radical Sandwich. 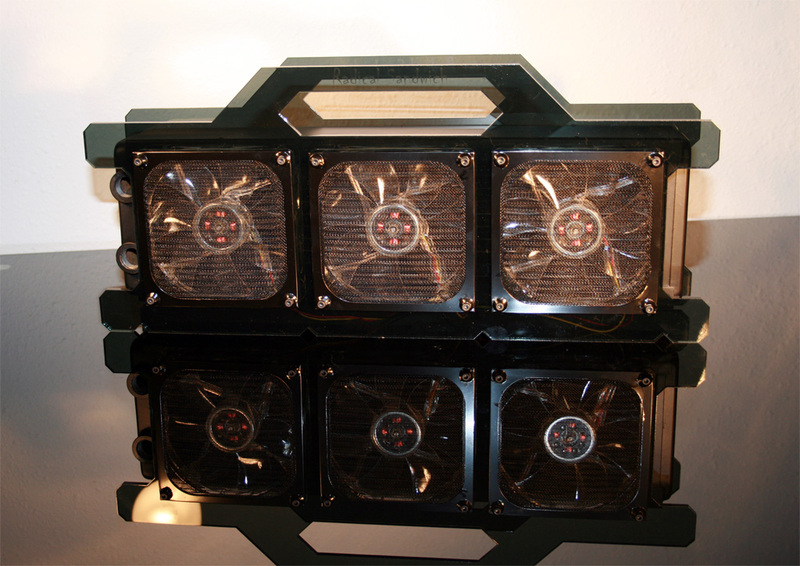 Put 6 fans in for push/pull configurations, or just 3 for Push or Pull. Choose from any 120mm after market fans to meet your specific needs. Put the final touches on with your choice of fan grills or filters. Mountain Mods Radical Sandwich is an exterior water cooling radiator housing, making it the perfect way to get the benefits of a large water cooling radiator into any size case. So whether you are tight on case space or just want to isolate the heat outside the box the Radical Sandwich will satisfy your appetite. Not only does the Radical Sandwich look good enough to EAT, but it will do just that - Eat away at your internal computer temperatures.